I guess the first truth is that they really aren't blue, but they are certainly species which have purple flowers on the blue tone, rather than the red tone. Secondly, the Nivalids are what we call members of the Crystallophlomis Section which use to be called the Nivales Section by Pax. These are all sturdy species which overwinter as large resting buds, have spear shaped, fleshy and usually farinose leaves often extending into a sheath like stalk. The most enigmatic of the blue nivalids are the Chinese species: P. farreriana, P. hoi, P. ionantha, P. lancifolia, P. leucochnoa, P. limbata, P. longipetiolata, P. melanops, P. optata, P. russeola, P. sinonivalis, P. woonyoungiana, P. youngeriana. There are other blue nivalid species, like P. macrophylla, but they belong in a separate discussion. Below is a table comparing views of Halda, Richards and the Flora of China regarding these names. All agree on P. farreriana, P. woonyoungeriana, youngeriana and P. hoi*. 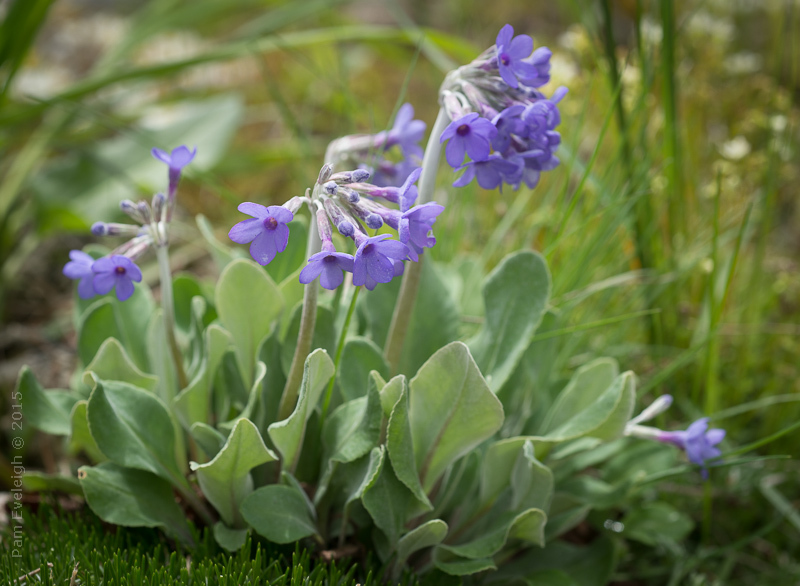 Primula russeola is also consistent with the exception of Halda also listing P. nivalis var melanantha as a synonym. This is definitely incorrect as this is a synonym of P. melanantha, the famous black primula which is now well known from the Zheduo Pass, Sichuan. Where they differ significantly is in P. limbata, P. longipetiolata, P. optata, P. melanops and P. leucochnoa. Halda confusingly has P. limbata and P. longipetiolata as both distinct and as synonyms. *P. hoi (formerly "hoii", but the spelling has been corrected according to the IAPT code of nomenclature). In order to understand these species I am researching the original descriptions, type locations, type herbarium specimens and expedition routes of the original collectors to try and understand the similarities and differences between these species. I take nothing for granted, and even though there is agreement between authorities, it is prudent to review all of these species in light of today's information. This is the first post in a series, with subsequent posts describing these species. I will update this post as I write each new post in the series, so there will always be links to the other posts at the bottom of this one. 1. Primula farreriana post is here. 2. Primula melanops post is here. 3. Primula longipetiolata post is here.